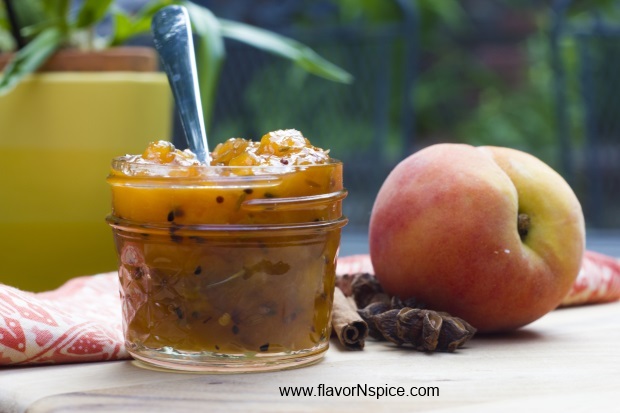 A few weeks ago I had made an Apricot Habanero Chutney. And since I made a ton of it, I had hoped that it would last me the whole year. Fortunately or unfortunately it was such a hit with my kids and friends that most of it is gone in just a couple of weeks! 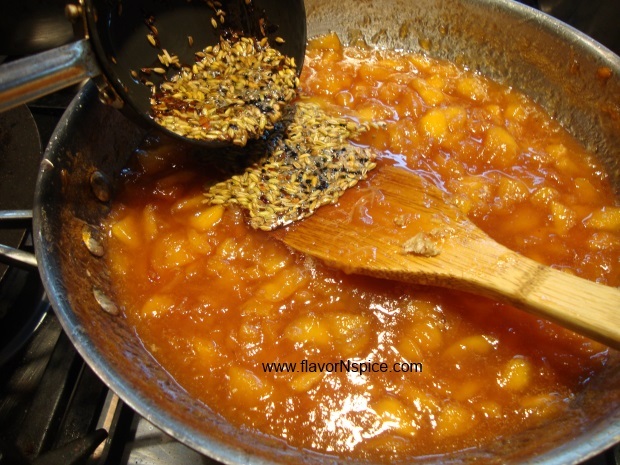 So two days ago I went looking for more apricots to make some more of the chutney but couldn’t find any ripe ones. Instead Eastern Peaches were on sale and so I bought those instead and made some spicy chutney out of them. It came out really well and this afternoon I had some with a hunk of salt Unikaas Reserve cheese on simple water crackers. It was a great combination because the cheese was salty and the chutney was sweet and sour! 1. Wash and chop the peaches in small pieces (throw away the stones). 2. 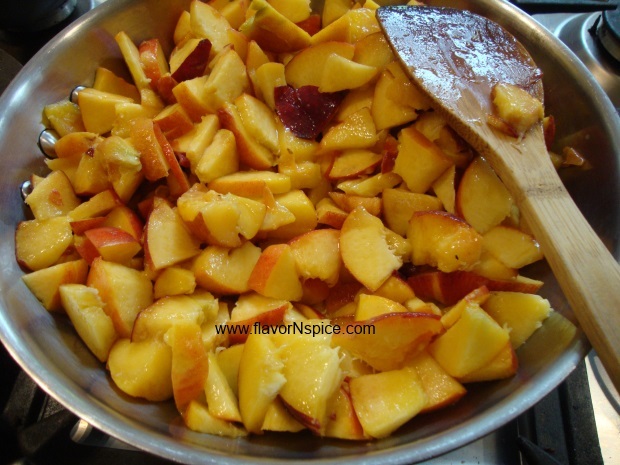 Place the chopped peaches in a large heavy bottomed container and heat it over medium heat. Continue stirring frequently. 3. 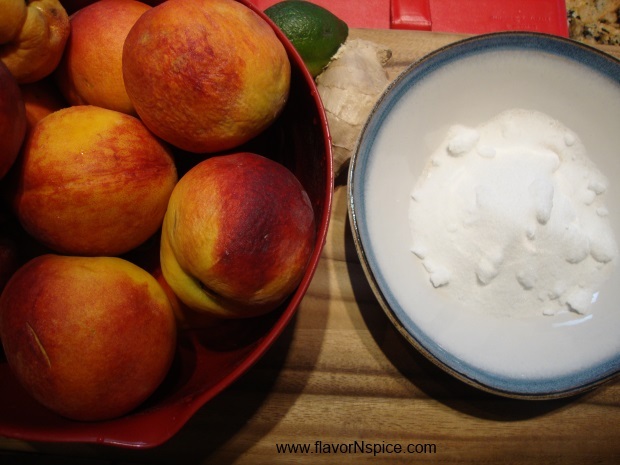 After 15-20 minutes of cooking the chopped peaches, add the peach schnapps to it and stir. 4. Continue cooking (and stirring) on low to medium heat for another 10-12 minutes. 5. 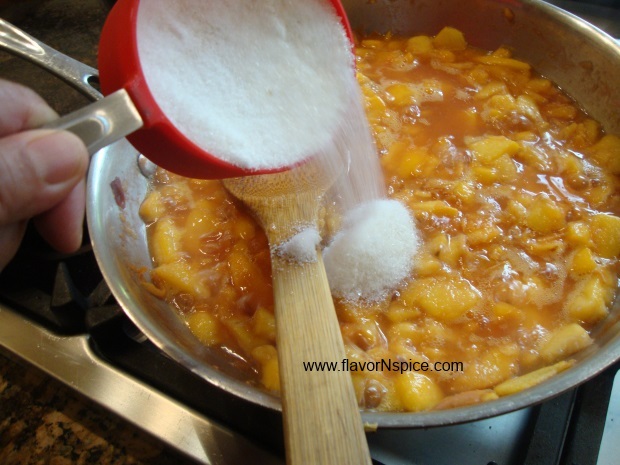 Add the sugar to the cooked peaches and stir. Cook for another 5-7 minutes. 6. Add the juice of one lime and cook for another 2-3 minutes. 7. Grate the piece of fresh ginger over the cooking peaches. 8. 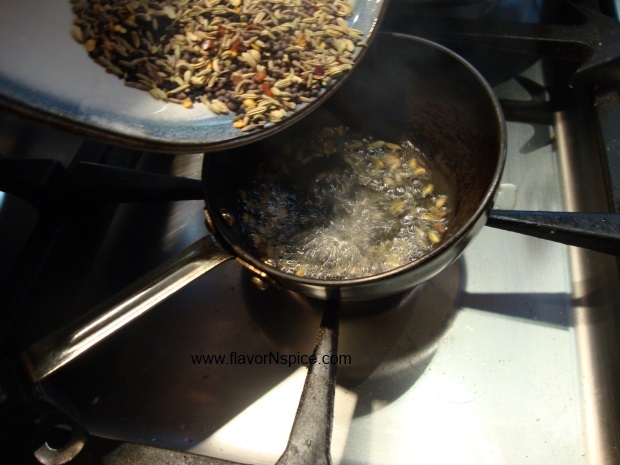 Also add the dry ginger powder and the cinnamon stick and the star anise to the pot and continue cooking for another 8-10 minutes or until the chutney looks thick and chunky. 9. In a small sauce pan heat the extra virgin olive oil and when the oil is hot, switch the heat off and add the following dry spices: cumin seeds, fennel seeds, Nigella seeds, mustard seeds and the red pepper flakes. 10. The dry spices will begin to sizzle in the hot oil and immediately pour them over the chutney and mix everything together. 11. 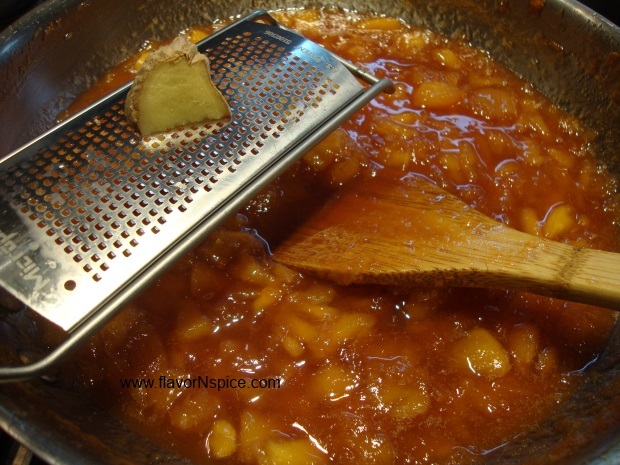 If the chutney looks thick and has the consistency of a thick jam, switch the heat off and if the chutney seems a bit runny even now, continue cooking it for more time until it looks thick and has the consistency of a jam. 12. Remove the Star Anise and the cinnamon sticks and pour the chutney in clean glass jars and seal them (by following the standard jarring instructions). 13. 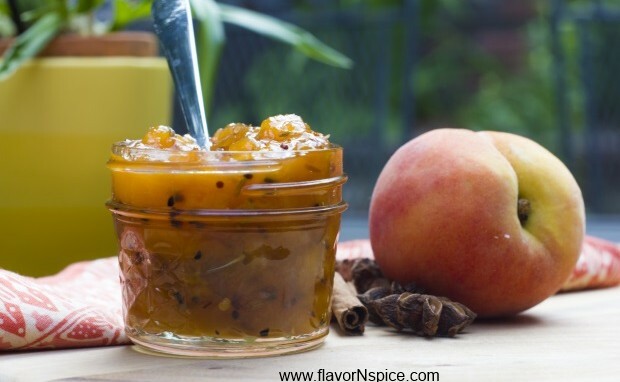 Serve this chutney with a cheese platter or you can use it as a glaze for grilled meats or shrimp. Loved your blog! Very intresting dishes and beautiful presentation. Is it okay if I share some of your recipes on my FB page? I’ll make sure the link to your blog is included clearly and mentioned explicitly whenever I use one of your recipes. I will definitely let you know and provide the live link to this website whenever I use one of your recipes and I’ll click the pictures of the final results I get. I do realize how much creativity and effort go into perfecting a dish and presenting it. 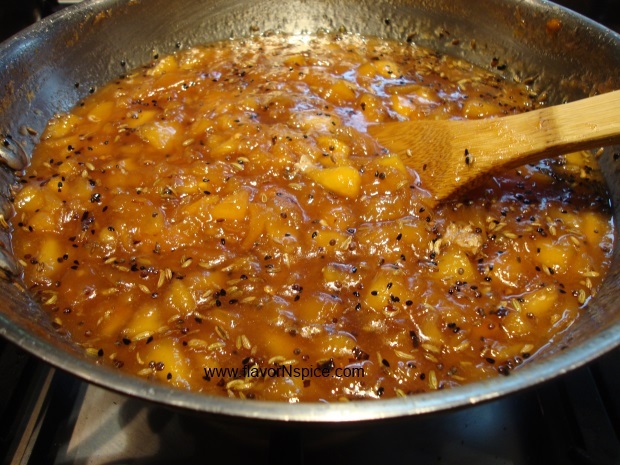 Hey Shabnam – I remember thinking that this recipe sounded wonderful when I first saw it but then I am sorry to say it slipped my mind when I actually set about making peach chutney a few weeks ago – the addition of the tadka is a great idea! 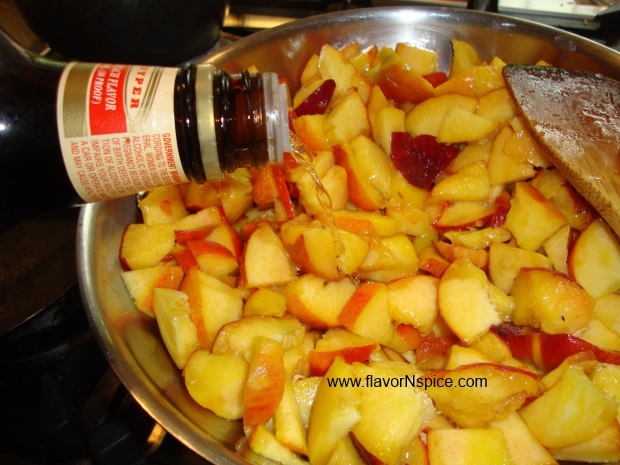 I will probably make more chutney one of these days while peaches are still available and will try it your way. One thing intrigues me, though. 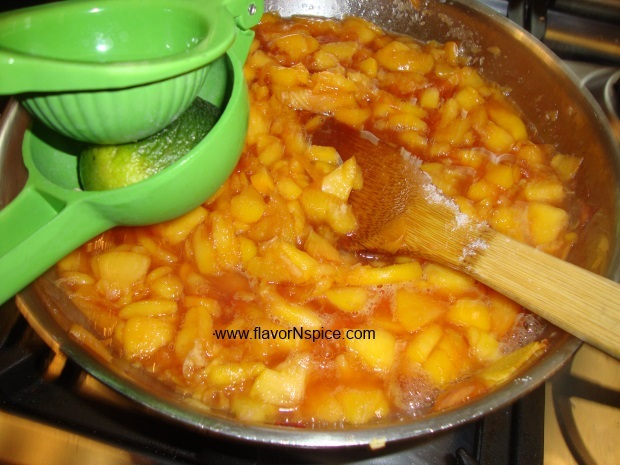 The other peach chutney recipes that I looked at call for skinned peaches – skin removed through a quick blanching. You seem to have left the skin on. With the extended cooking, does the skin come off and float around in the jam?